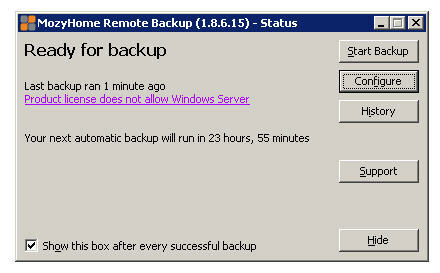 Now that most of the home data is sitting safely on the Windows Home Server it’s time to think backup strategy. It’s called a strategy for a reason – disaster is not something you want to experience but it’s an absolute certainty that it will happen so you plan. Our truely precious family data (mostly financials, documents and pictures) are stored on Own Web Now’s enterprise storage network, that thing is never going to disappear. Until now I also used MozyHome backup service, although highly amateur and frankly substandard form of offsite backup by any measure, you cannot beat backing up a few TB of raw video and mp3’s for $55 a year. Worked fine on the workstations. Mozy doesn’t support Windows Home Server. It does not even support file shares (presumably for this very reason) so no way of running it off a workstation to backup Windows Home Server file shares. Now MozyPro supposedly does the file server backup but at $0.50 / GB, I’m more inclined to trust OWN for twice the cost. So Mozy, bye, bye. Life with the Windows Home Server is pretty sweet. Today we spent the afternoon streaming Die Hard 4.0 from Windows Home Server to the Xbox in the living room. Katie spent the morning listening to the MP3 streams from the same. So does OWN have an add-in available for WHS to backup said “precious data” to the cloud? If not, then plans to release? Nope, no plans to release one either. The WHS deployments we’re currently testing in the field all use AhSay since its the SBS 2003 core.